Candles can sometimes be a girl’s best friend, but put them together with the luscious smell of a library? Match made in heaven I say! 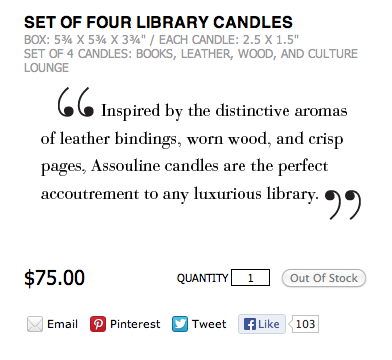 Assouline.com – also known as the place for ‘The Most Sophisticated Books in the World’ has a range of candles inspired by the best teacher – The Library. *All photos are courtesy of http://www.assounline.com. The scents range from Books, Leather, Wood, Culture Lounge and Havana. 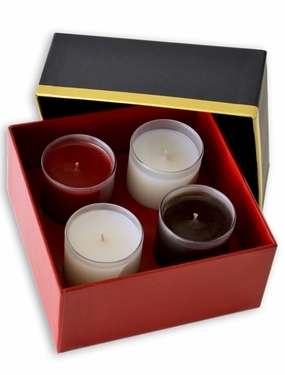 Each candle is $49.00, is 3.5 x 3.5 x 3.5″ and weighs 6.8oz. A quote is etched on the glass container. It’s also possible to buy four candles at once for a steal of $79.00. I know the prices are a bit much for a candle, but you might spend the same amount for a truly beautiful book right? Exquisite and elegant these candles are high class and I wish I had the option of smell and sniff on the blog, because I bet the aroma is the big selling aspect for these candles!